Aston Villa have been accused of adopting a long-ball game by some critics this season, but I don't think those people know what they are talking about. When you possess players as quick as Gabriel Agbonlahor and Ashley Young, it makes sense to release them by bypassing the midfield sometimes. You could call it playing from back to front. Anyway, the facts speak for themselves - Villa have the best league record against Manchester United so far this season, beating them at Old Trafford and then drawing at Villa Park. I would still regard Manchester United as favourites for the Carling Cup final, but at least the Villa players will go into the game with the confidence that they can beat Sir Alex Ferguson's side. So what has been the key to Villa's success? Well, for a start they are very well organised and extremely sound defensively. In fact, they have the best defensive record in the Premier League, conceding only 21 goals in 26 games. That gives them the ability to withstand quite a bit of pressure and allows them to counter very quickly. Plus they have the big boys like John Carew and Emile Heskey so they will get the crosses in rather than play into feet in and around the box. Whether it's because of this method or not, goals have been hard to come by for Villa this season. Yes, they put five past Burnley recently, but they have only scored 37 in the league. That's not a lot when you consider that they are seventh in the table. Maybe teams have become aware of their pace and aerial threat. The lack of goals may also be down to the fact that Villa boss Martin O'Neill has chosen to play with only one frontman at times. If he does decide to go with two up front, as I think he might, O'Neill will not worry too much if his side end up having less of the ball than United. Villa are capable of winning games even when they have less possession than the opposition. 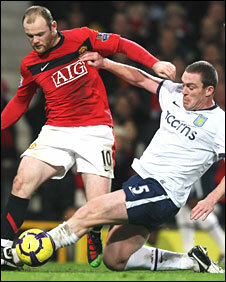 The problem for Villa comes if Ferguson decides to swamp the midfield and play Wayne Rooney on his own in attack. Villa then might end up chasing the ball a little bit. They could match United by playing five in midfield but I would say that any alterations should be made in order to win the game. If a manager makes changes in order to stifle the opposition, it can be viewed as a negative tactic, which in turn can have an impact on the mindset of the players. That's the last thing you want going into a cup final. The other reason I think Villa may start with two up front on Sunday is that they can then make the most of Young and Stewart Downing on the flanks. When Downing joined the club from Middlesbrough, a lot of people wondered what would happen to Young given he usually plays on the left. But O'Neill has ensured Villa can accommodate both players and make the most of their talents. Young and Downing are very dangerous because they have the ability to take players on, can cross the ball well, and switch from one flank to the other during the course of a game. A right-back like Rafael, when faced with a winger like Young who is naturally right-footed but can also use his left, can find it hard to stop crosses being put in. That's why Heskey or Carew alongside Agbonlahor would definitely be to Villa's advantage, in my opinion. Rooney is in great form and can play either with a strike partner or on his own. He scores whatever role he is given. Villa have managed quite well against him this season, with Richard Dunne and James Collins forming a formidable centre-back pairing in the heart of the Villa defence, but they will have their hands full. If Rooney does start alone up front, then I would expect Ji-Sung Park and Antonio Valencia to provide support from the flanks. He might not be one of the glamour players but Park is a manager's dream. When I saw him play against AC Milan, he was absolutely first class. A lot of the work he does is the kind that can go unnoticed. When Milan had possession, he looked to mark Massimo Ambrosini. When United had the ball, he was free to go where he wanted. Park does exactly what Ferguson asks for - and if he is needed to fulfil a hard-working role, then not many players are better than him. With Young and Downing looking to attack at every opportunity, he will have another chance to prove his worth on Sunday. Ferguson tends to use him in the big games and Sunday's final against Villa is certainly one of those. Despite the attacking talents on show I can even see this game going to penalties because it will be so tight. You can probably guess who I hope will win - it's about time Villa won a trophy.